Chorsolisten der Komischen Oper, Berlin, Orchester der Komischen Oper, Berlin / Henrik Nánási. Komische Oper, Berlin, Germany. Sunday, July 10th, 2016. 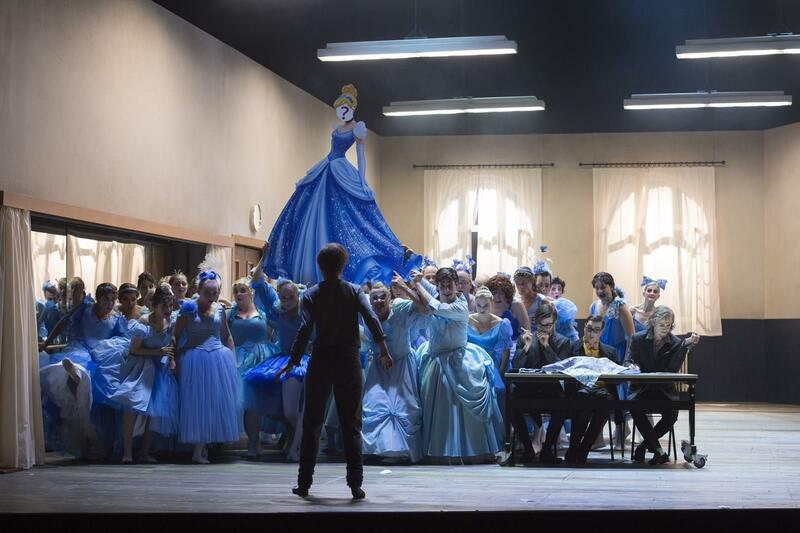 Tonight marked the last performance of the run of Damiano Michieletto’s production of Cendrillon and indeed was the last performance of the Komische Oper’s 2015/6 season. 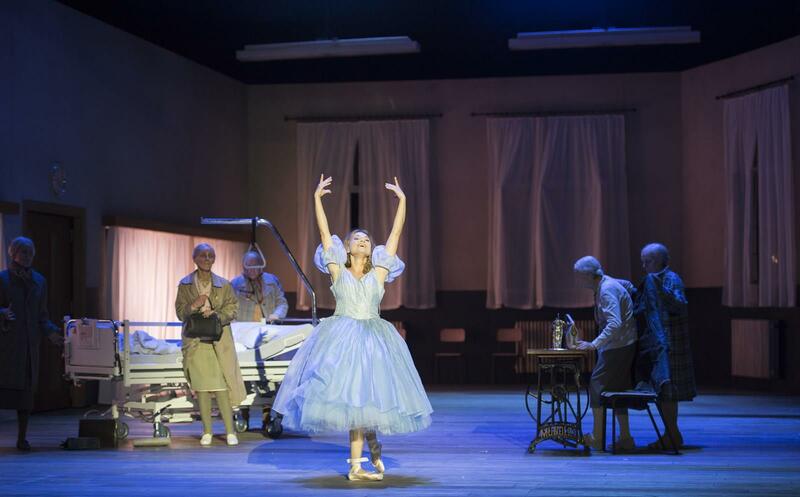 With some superb singing, an insightful and deeply moving production, and excellent chorus work and orchestral playing tonight once again showed the Komische Oper at its considerable best. Indeed, tonight also confirmed Michieletto’s reputation as one of the leading opera directors of today. As with his Trittico in Copenhagen and his Cav & Pag at the London Royal Opera, he finds beauty and dramatic truth in the everyday. The setting is a dance studio where Pandolfe is the janitor and Madame de la Haltière is the dance teacher. Dressed in a garish top with some attempt at glamour, Madame is clearly a social climber who wants to leapfrog on one of her daughters marrying the Prince to better her station in life. The Prince is perhaps the son of the owner of the dance school. During the first part of the show we see chorus members training to dance in order to impress the Prince at the ball. Cendrillon however is confined to her bed after an accident – her leg contained in metal casing. After being visited by la Fée and her attendants, she manages to attend the ball, her injury cured. Later her injury is used by the other characters to hurt her whether by kicking it or by pressing it. It sets her apart as not being able to compete in the competition for the prince’s attention but also enables us to empathize with her as a sympathetic character who simply wants to escape the fate that life has given her. Where Michieletto succeeds is in that he makes clear that everyone can find their prince charmant – they just have to be open to finding him. In the second half as Cendrillon dreams of the future we see a stylized ballet display of doubles of the Prince and Cendrillon dancing together. 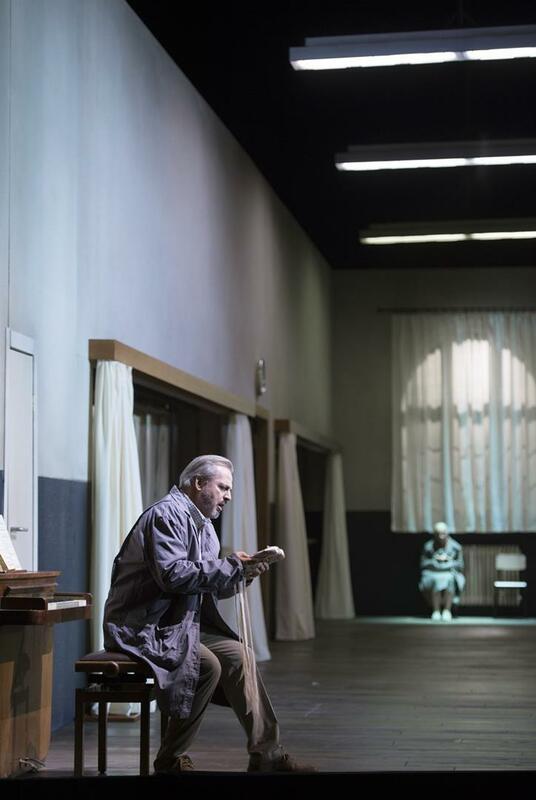 Yet, it seems that for Michieletto love is imperfect but also real – it can be found even in the most unlikely of places, especially when one isn’t looking for it. He keep us waiting for a resolution though in that Cendrillon and the Prince do not get together until the very last seconds of the show. While the other characters fight each other over their inability to win over the Prince, both he and Cendrillon are left alone at the front of the stage finally able to express their love. I found it a remarkable piece of theatre, one that found the beauty, the anguish and the longing in the piece as well as the wonder in finding true love that might not be quite what one expected it would be. Furthermore, it seems that for Michieletto love isn’t material – it’s not found in status or in wealth but between two people who simply fall for each other. Both the personenregie and the singing tonight really brought that to life. 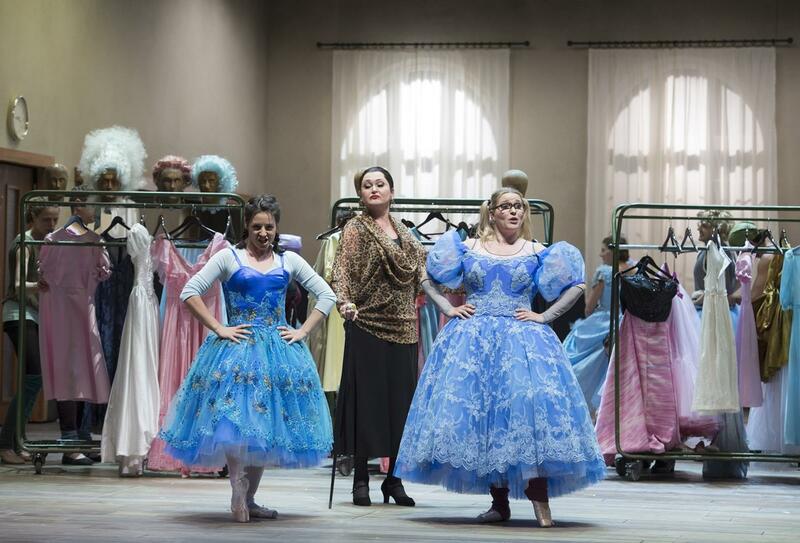 Musically, Cendrillon is a tricky piece to pull off partly because the languidness can result in pacing issues that mean that the evening can feel a tendency to drag. Fortunately, in common with last night’s Hoffmann what really distinguished tonight was the quality of the diction. This was music-theatre that lived off the text, every single word from every single singer on stage was absolutely clear. Nadja Mchantaf is new to me but she was a very fine Cendrillon. Hers is a full lyric soprano which had no issues with the higher reaches of the part. The tone is creamy and attractive and she offered so well-supported diminuendi and pianissimi during the course of the evening. Very occasionally the voice had a tendency to sit under the note but this was something that passed quickly. 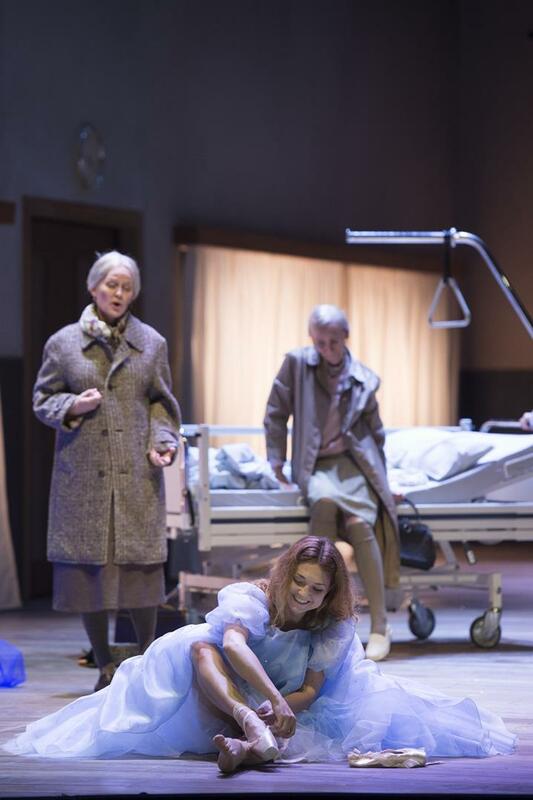 She is also an engaging actor fully demonstrating Cendrillon’s journey from happiness to despair and back again. Her attempted suicide with pills was harrowing to watch. Just 24 hours after singing the Muse in Hoffmann on this very stage, Karolina Gumos also had another massive sing tonight as the Prince Charmant. She was ardent, warm and rich in tone and the tessitura held absolutely no terrors as she offered uninhibited singing throughout the range. The voice has good resonance and she ably matched the character’s journey from ennui to a recognition the he had finally found true love. Despite two challenging assignments over two evenings, Gumos was absolutely tireless. Agnes Zwierko was a formidable Madame de la Haltière. The voice is big and round and with a tremendous chest register that she wasn’t afraid to use. She is a natural comedian and dominated the stage whenever she appeared. Werner van Mechelen is also a natural storyteller and this informed his singing as he sang with a lieder singer’s attention to text. The voice was also immaculately produced with not a hint of strain in the higher reaches of the part. Caroline Wettergreen was a fabulous presence as la Fée. She was absolutely effortless right at the top of the voice and never compromised the diction to compensate for production. Her acuti were always spot on and every single staccato was immaculate. She also has a genuine trill. The remainder of the cast reflected the very high standards this house sets for itself with not a weak link in the large cast. The chorus sang very well with excellent blend, tight ensemble and great amplitude. They are a highly responsive group who engage fully with the director’s vision and execute everything asked of them with accuracy and aplomb. The house band played very well – apart from a few rapid figures where the strings weren’t quite unanimous. The brass especially stood out for the big, bold depth of sound. Henrik Nánási led a reading that was light on its feet and he managed to avoid any longueurs. Perhaps the initial duet between Cendrillon and the Prince could have used a little extra space to work its magic but otherwise it was well paced and he revelled in the richness of Massenet’s scoring. Tonight was a deeply emotional evening performed at the very highest level by the principals, chorus and orchestra. For those of us who have made our homes in the UK, there was an added poignancy in the duet between Pandolfe and Cendrillon as Pandolfe sings ‘Et nous retournerons au fond de nos grands bois … Là là! nous serons heureux!’ it brought home to me the fact that happiness is transitory and that even in the darkest hours there is beauty to be found by looking to the future and being optimistic. Indeed, as Michieletto makes clear, love and happiness are not found in materialism but in the relationship between people. This was a remarkable evening of music-theatre by a master storyteller.